Kids are going to get plenty of toys this holiday season. Why not take advantage of this gift-giving opportunity to give kids a gift that will also benefit you? Clothes are the classic choice for the gift that also meets the needs of the parents, but you should think better. 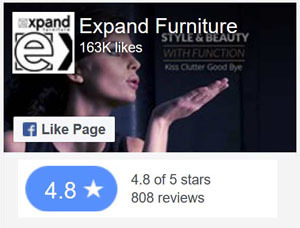 Take advantage of this opportunity to dress up your kids’ rooms with fun furniture. You’ll create the look you want while also giving kids something they will enjoy. 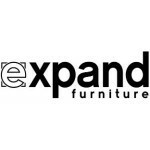 The unique wall shelves at Expand Furniture are an ideal choice. Our wall shelving comes in a variety of designs that are perfect for kids’ rooms. These kids’ wall shelves will help keep toys and other odds and ends organized while also creating a fun design for the room. Puppies are great design choices for boy or girl rooms. Everyone loves a snuggly puppy! 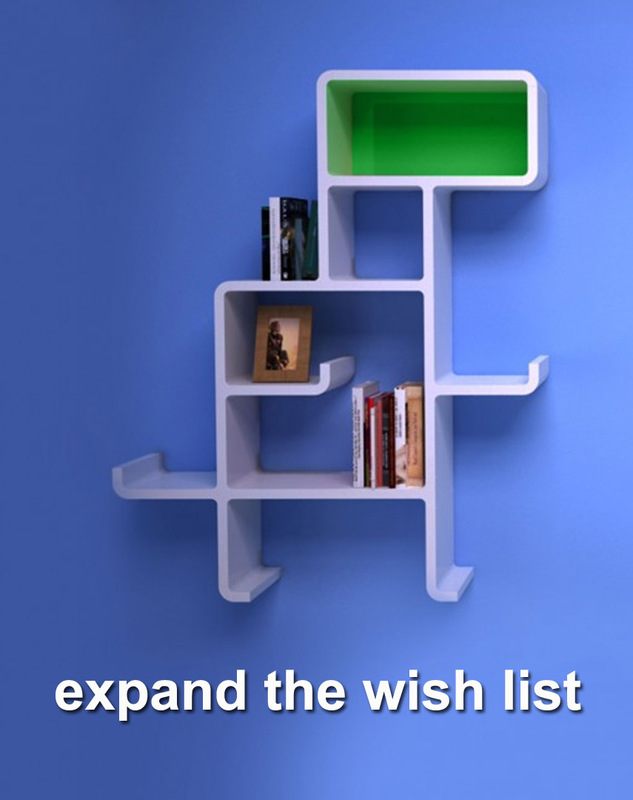 This modular shelving unit is shaped like a cute puppy, including the head, body and legs. The body is dissected by shelves, creating plenty of storage options for books and toys. The head has a colored panel that can be chosen to match your decor. The pieces all snap together easily, and you can change the design at a later date if you choose. That way, the shelving unit can grow with your child. When the puppy design is no longer in favor, just redesign it to something else. 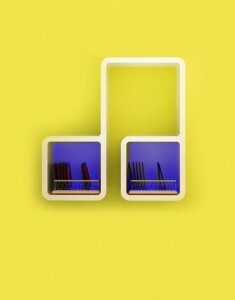 For musically inclined kids, this note-shaped wall shelving is a great choice. The two balls of the note are square-shaped cubbies where you can store books or a few favorite toys. The backing for the cubbies is colored, and you can choose it to match your decor. You can hang this shelf high to keep fragile items away from small hands, or you can hang it within reach of older children so they can easily access their things. These unique wall shelves are designed to look like a dolphin blowing water out of its spout. 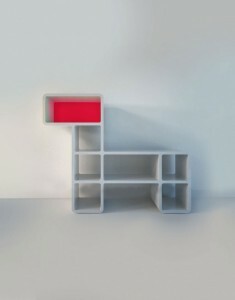 Two cubes form the body, and a singular shelf forms the tail. You can even stack books on top of the head and the water spout. One of the cubes can hold a drawer that will store smaller items without risk of falling off the shelf. The drawer is collapsible so that it can be easily stored if you don’t need to use it. Everyone will love the dolphin wall shelf unit. These kids’ wall shelves are great for a boy or a girl’s room. The body holds a storage cube, and the arms and legs form shelves. The head is a separate storage cube. The unit doesn’t have any backing, so the walls provide the coloring. If you really want to have fun with this gift, you can put the running hero next to the puppy or the dolphin, making it look like the hero is running from the other. You can make a whole scene with the right shelves and other accessories. 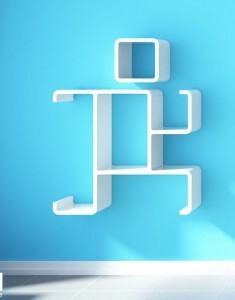 This dinosaur shelving unit would make the perfect pair with the running hero. The dinosaur unit has a lot of storage options, including multiple cubes and shelves in the body and the arms. The head has a colored backing that you can choose to complement the decor. Kids will love displaying their dinosaur collection on this shelving unit, but they can also display books and other items. These unique wall shelves will be a welcome gift by children of all ages. 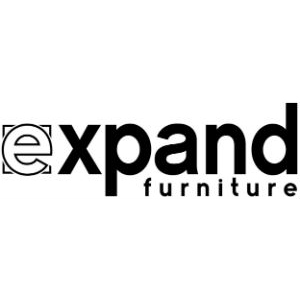 Expand Furniture is committed to offering furniture that is as stylish as it is practical. Our wall shelving is not just useful for adults — the right systems are also unique gift ideas for children. These kids’ wall shelves add a touch of whimsy to any kids’ room, while also offering tools for keeping toys and books organized. Consider giving these unique wall shelves as a special gift this holiday season. 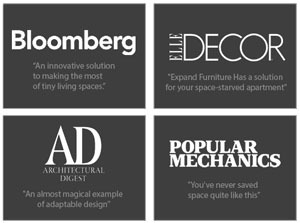 Then explore our catalog or contact us to find other space saving furniture for your home and buy yourself a little treat.